The fact that we, the vaping industry, are being treated, classified and regulated in the same way that the tobacco industry is. They are treating us like Coke and Pepsi, when in reality we are more like Oil and Water. I can't even think of anything more completely opposite. After Bill 60 here in Nova Scotia, we felt like we had a victory. I do not believe that to be true now. Granted, we were not shut down, but now public perception is that we are just another form of smoking tobacco and the media isn't helping when it comes to clearing up that misconception. Oh no, they say, you will have your own classification. Yet, there we are in the black and white, in the 'Tobacco' Access Act. This is even after producing evidence that we are in no way a tobacco product. You will get exemptions for vape shops, that was a flat out lie, it was conveniently left out of the final draft of the legislation. Oh, and they also assure us that they will never tax us as tobacco. Ya, after all this? I don't trust that anymore. We just were not prepared for the interactions with politicians. We thought that we could win with science and logic on our side. The politicians said all the right things and patted us on the back until we realized that what they were doing was inserting a knife. Now they have us by the short hairs. We have been inserted into the Tobacco Access Act. Every day when I open the door to the shop, I stare at this. And every day, I begin a slow burn. I am angered and completely offended by having the word TOBACCO on the door of our shop, in which WE DO NOT SELL TOBACCO!!!!!!!! The following is the speech I presented to the Law Amendments Committee. Along with lab results of the e-liquid showing no tobacco content. All on public record. My name is Eva and I am co-owner of the End Vapor Shop in New Glasgow and Truro. I thank you for allowing me to speak today on the matter of amendments proposed to the smoke free places act. Bill #60. This bill is old fashioned slight of hand designed to make it impossible for any MLA in the house (regardless of their affiliation) to vote against it. It’s battle cry? THINK OF THE CHILDREN AND GET RID OF FLAVORED TOBACCO ONCE AND FOR ALL! Then in the fine print it exempt the only flavored tobacco that anyone is even aware of. In reality it is a direct shot across the bow of anyone who tries to compete with big tobacco. I really thought that I, and the other approximately 50 speakers, got through to them. When the committee sat down for Law Amendments, they had no idea that the bill in front of them was complete and utterly useless. There was not a single MLA in that building, (and believe me by the end of the day, every single one of them made an appearance at committee) not one of them understood that e-juice contains NO TOBACCO. Think about that for a minute. 'CONTAINS NO TOBACCO'. If you could have seen the look on their faces when they realized that. The Liberals especially were embarrassed that they had supported a bill for a ban on tobacco that would have absolutely no effect on tobacco. Had everyone just sat back, this bill would have been a slam dunk for the Liberal majority government. 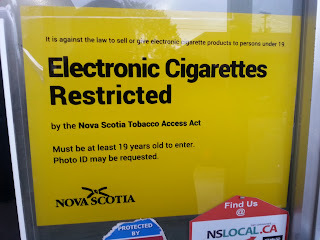 Until the legislation (Bill 60) was introduced, I and pretty much everyone I have spoken to was only aware of one flavor of tobacco and that would be menthol. Thanks to the liberal government I (and any kid that watches the news) am now aware of watermelon cigarellos. Sounds like the LIBERALS are the ones responsible for marketing flavored tobacco to children. Great job! I could go on forever, but in my opinion, the new fight has to be to get e-cigarettes separated completely from traditional tobacco. Period. 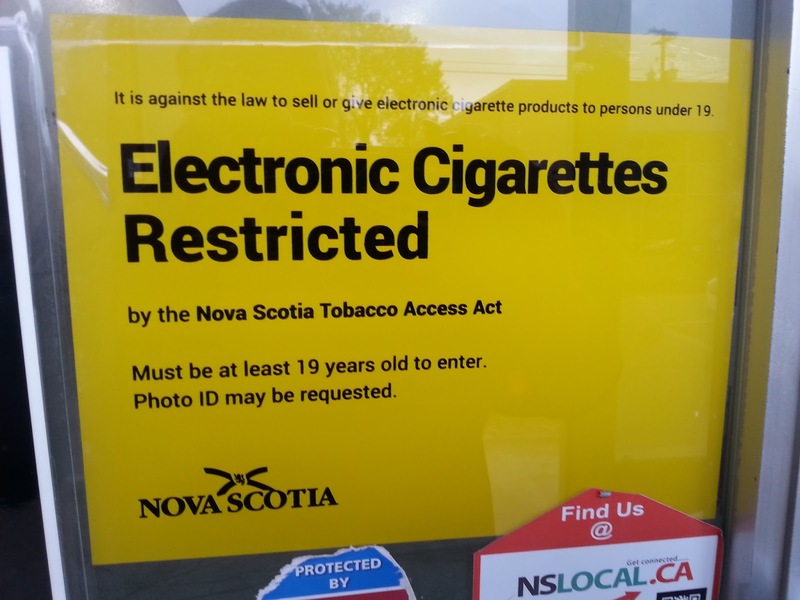 For my own sanity and for the sake of all smokers looking for a better tobacco harm reduction option, I need that sign off the door.